Technology is changing the landscape of learning and teaching in America. The use of virtual worlds enable engineering and technology programs to implement software programs such as Second Life and Open Simulator to enhance what they may currently already have. Additionally, virtual worlds can add a more dynamic environment in the online classroom for multiple platforms such as the Personal Computer (PC), wearables, and mobile devices. The purpose of this chapter is to provide a review of these programs to include how to implement these items into an engineering course. Further detailed in this submission is how to incorporate Institute of Electrical and Electronics Engineers (IEEE) documentation and other engineering guidelines into the projects. Included in this chapter is a detailed layout of a simulated environment as well as various approaches of structuring and organization for classroom activities. Ubiquitous Learning (U-Learning), supported by the revolutionary and abundant digital resources, is viewed as an effective learning approach for situating students in real-life and relevant learning environments that supports and promotes a variety of learning needs. 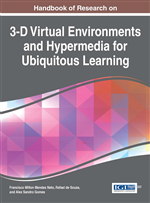 U-Learning involves applying ubiquitous technologies in the enhancement of education strategies and models. Embedded Internet-based devices that we use in our daily live can present a supportive environment for U-Learning. The rise in Internet availability and accessibility has truly made a significant number of learning resources and options available to today’s students at all levels of education. U-Learning has the unique power of providing educational resources in a manner that is flexible, calm, and seamless due to its pervasive and persistent model (Martinez-Maldonado, Clayphan, Muñoz-Cristóbal, Prieto, Rodríguez-Triana, & Kay, 2013); U-Learning aims at removing educational and learning physical barriers by utilizing the advancements in technology The ubiquitous learning has become more than a technology phenomenon and a prominent vision that strives to revolutionize the educational landscape and present technology-driven educational settings, because it thrives on the concept and idea of making a variety of educational and learning assets available to students, creates new and varied learning environments, customized learning and enables the realization of a series of training activities from anywhere, anytime and from any device (Durán, Álvarez & Únzaga, 2014). Ubiquitous and pervasive learning environments offer students unique possibilities for team work and collaboration both face-to-face and remotely. These environments include an array of modern and innovative technologies at different stages of adoption: interactive whiteboards are already available in many classrooms; interactive tabletops are just starting to be introduced in schools (Kharrufa et al, 2013), and handheld devices are already used by students and teachers in the form of smart-phones or tablets. Many studies in the past have investigated the effectiveness of deploying different learning and teaching styles with different U-Learning environments to determine which strategy produces the best learning outcomes for students with different learning needs. It’s important to note that developing a u-Learning space has to take into consideration the outcome of the existing learning theories in terms of best practices, such as a structured relationship between information and learners’ understanding in educational settings. This helps to prevent learning isolated from a meaningful context. For example, if a student understands why and how something happens rather than just being told that it is true, then the information is more relevant and, therefore, is more meaningful to the student. The rationale for this is that how is the inclusion of the pedagogical information; and why is the inclusion of interactive learning, allowing students to create knowledge from what they perceive (Ogata & Yano, 2012). Colorado Technical University has successfully deployed an award-winning, revolutionary U-Learning system that is called “ Intellipath”. Intellipath™ is adaptive learning software that personalizes learning based on a student’s pre-determined knowledge state on a particular subject or topic, and creates individual learning nodes, or steps for the student to ensure the student understands each element to a specific unit of work. Intellipath™ allows the instructor and students to work closely together to ensure transfer of learning is taking place. What is unique about this learning technology is that the learning lessons are connected throughout the entire course map. Work on one node influences learning on other nodes in the course map. Learning is a continuum throughout the course, assessment is constant, and by revising nodes students can continually improve their learning. Quality Management: A process that ensures products or systems meet a specific standard ( Westfall, 2008 ). Linux: An open source version of the UNIX OS (Perens, 2009 AU52: The in-text citation &quot;Perens, 2009&quot; is not in the reference list. Please correct the citation, add the reference to the list, or delete the citation. ). Software Engineering: A discipline that focuses on the application of engineering to the design, development, integration, and maintenance of software ( Ghezzi et al, 2002 ). Requirements Engineering: Per IEEE this refers to the process of defining, documenting, and maintaining requirements for a program. This can be applied to systems and software engineering (IEEE Computer Society, 1998 AU54: The in-text citation &quot;IEEE Computer Society, 1998&quot; is not in the reference list. Please correct the citation, add the reference to the list, or delete the citation. ). Open Source Software: Software that allows the original source code to be free available which may be freely redistributed or modified (Perens, 2009 AU53: The in-text citation &quot;Perens, 2009&quot; is not in the reference list. Please correct the citation, add the reference to the list, or delete the citation. ). Second Life: An online virtual world, where people can socialize and connect with other people all over the world ( Boulos, Hetherington, & Wheeler, 2007 ).